Support SMILE By Buying Trev's Prints! Many of you will be aware that Wednesdayite distribute matchday tickets for Owls games at Hillsborough in recent seasons through our successful Smile Tickets scheme. As the kick-off for our 2012 appeal, Wednesdayite member, Owlstalk legend and loyal SWFC fan Trev has created something very special for you as a thank you for your SMILE donation! Last season we raised over £3,500 and this enabled us to purchase 18 season tickets from the club to use for each and every League One home game. Now the mighty Owls are soaring into the Championship, we aim to raise more this time around and buy as many tickets as possible. Trev's incredible talent and kind gesture gives us a real chance to make a difference to the lives of Wednesday fans who have - through no fault of their own - been unable to come and cheer on the team! Up until now the largest single group of recipients have been The Children’s Hospital patients and their families, followed by local school children, youngsters playing for the Owls Trust All Stars teams based in Darnall, children from local care homes and those of parents who have been unfortunately struck down by illness, infirmity or redundancy and who cannot now afford to bring their families and kids along to Hillsborough. 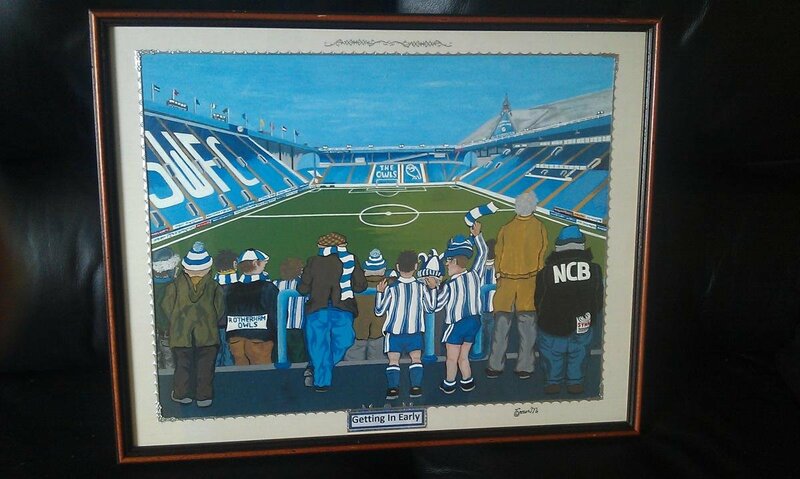 DONATE TO THIS WORTHWHILE SCHEME - AND GET AN INCREDIBLE ONE-OFF PAINTING OF HILLSBOROUGH! We can send to you via post - or alternatively you can save the P&P by collecting your print from either the Wednesdayite stall at the upcoming Owls In The Park fun day, or at the Wednesdayite Lounge before the WBA friendly - where we're sure Trev himself will be happy to shake your hand and toast to the new season! Update at 19th July 2012, the cut-off for the first sales batch has ended and all postal orders have been packaged and despatched. 290 have been sold. If you paid for one to be collected it will be available at the Fun Day on 29th July 2012 or in the lounge at any future home game. Orders placed after 18th July 2012 and before the 28th July 2012 will be posted after the Fun day on 29th July 2012. SMILE runs every season and is Wednesdayite's major charity endeavour. Wednesdayite will then assess the nature of the nomination and respond to successful applicants as soon as possible. We would like to repeat this hugely successful activity next season and so we are asking as many of you as possible, who can afford to, to help us raise enough to renew our block of season tickets. Please help us to bring some smiles to deserving folk - existing fans and new members of the Owls community!